The 450 Bushmaster is becoming more popular. At present, not counting, the semi-auto rifles, we have CVA offering a couple of single shot rifles. Ruger has a couple too. Plus Christensen is offering one as well. I think that one also can get barrels for the Thompson Center single shot rifles too. With some of the major retailers, like Cabelas, selling factory ammunition for the 450 Bushmaster helps a lot with it becoming more popular. Some of the larger LGS's around me also stock some ammo for it as well. anymore updates on the Christensen Arms Mesa .450 Bush Master? Have you been able to consistently shoot 1MOA groups at 100 yds? I'm very interested in this rifle but looking for some re-assurance before spending the big buck! I live in SW Michigan and there are several custom rifle builders making nice .450 bushmasters but the MESA seems to provide the most bang for the buck and features for the $1,500 range. I spoke with Christensen Arms at their booth at SHOT show. They said the Mesa will shoot sub-minute, they just won't guarantee the accuracy because the cartridge headspaces on the case mouth and it was a "limitation of the cartridge". I fully expected that would be the answer, but I wanted to hear it from them myself. Based on this site, I was confident enough to buy one for myself. If it shoots half as good as it looks, I'll be thrilled. With 6 inches of snow on the ground, below zero windchills, and a few more inches coming, it will be a little bit before I can shoot mine for groups. ETA - You can pick up a new Mesa 450BM on Gunbroker for $1295 with free shipping from EuroOptic as the seller. That's a little cheaper than most 450 custom bolt gun builds. 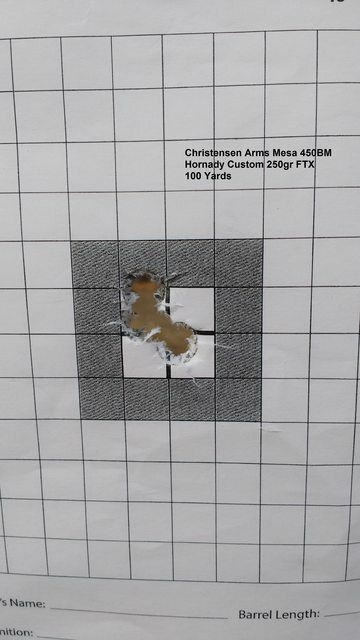 illinoishunter wrote: anymore updates on the Christensen Arms Mesa .450 Bush Master? Have you been able to consistently shoot 1MOA groups at 100 yds? I'm very interested in this rifle but looking for some re-assurance before spending the big buck! I live in SW Michigan and there are several custom rifle builders making nice .450 bushmasters but the MESA seems to provide the most bang for the buck and features for the $1,500 range. Just needing to find time to do more load devopment testing. Last time out it shot 1/2 MOA pretty easy with Hornady Custom ammo. One of these days I’ll put a 5 shot group together worth posting about. Christian Arms $1500 !! The first 3 shot group from my Ruger American Ranch 450BM looked exactly like that group!! And I could buy 3 of them for that price! !